circumference. A road circles it called, surprisingly, Mirror Lake Drive. Mirror Lake Drive turns into Main Street in the downtown section where almost all the retail activity occurs. A lovely brick sidewalk also circles the lake and the three mile "walk around the Lake" is a great way to get a little exercise and have a business meeting. 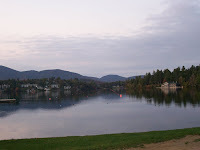 Aside from all the recreational opportunities, it is nice to have a lake as 'the center of attention' on a daily basis.